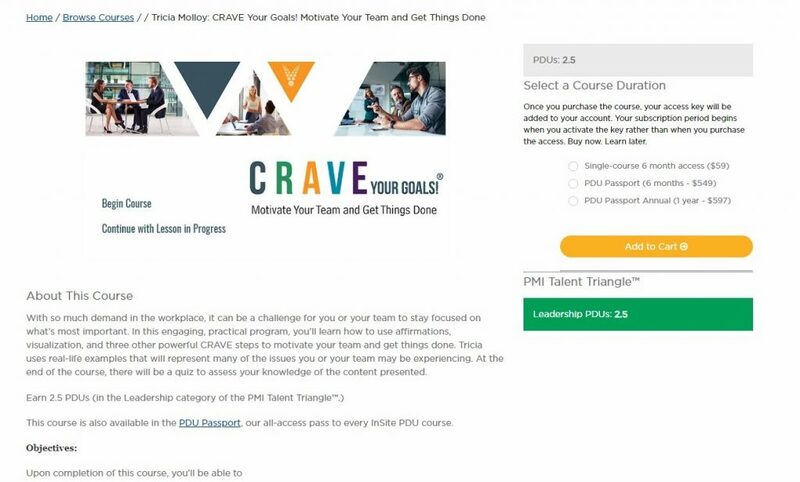 For more than a decade, I’ve been teaching the goal-getting CRAVE formula at organizations like The Home Depot, Walmart, the CDC, Deloitte, Kimberly-Clark, the Project Management Institute and the Network of Executive Women. It’s now available to you as a convenient, immersive online course called CRAVE Your Goals! Motivate Your Team and Get Things Done, from Velociteach. Project managers receive 2.5 Leadership PDUs for taking this 2.5-hour course. However, it’s a valuable instructional program for anyone who wants to learn how to use simple strategies to make 2019 their best year yet! You choose the time, location and pace. My course will show you how and why to clean out the clutter, raise your energy, use affirmations, visualize—including the steps to create and use a vision board—and express thanks. If you’ve already heard my CRAVE Your Goals! talk, this course is a great refresher and you can share it with your accountability buddy for more support. It includes video, worksheets and infographics. Treat yourself to this unique professional development opportunity. Click here and use the promo code CRAVE15 to receive 15% off the $59 price.